Eidsiva Nett AS and Aidon have today signed a contract for the delivery of an advanced smart metering solution (AMI) which will serve 143 000 customers of Eidsiva Nett. Eidsiva Nett is an electricity distribution company operating regional electricity distribution network in Hedmark and Oppland. In addition to smart electricity meters, the contract includes a head-end system for meter reading, as well as the related IT-systems and services for the project implementation. While fulfilling all the ambitious regulatory demands for AMI in Norway, the new solution will enable Eidsiva Nett to implement new advanced functionality into their network. This includes net station monitoring, monitoring of energy delivery quality, as well as earth failure detection for every household. These allow Eidsiva to ensure reliable and safe electricity supply to their customers and at the same time save costs in their own operations. – Signing this contract with Aidon is an important milestone for us. After a comprehensive evaluation and negotiation period we are now ready to start the actual project. The result will be a modern AMS solution that provides us with a situational awareness of our low voltage distribution network, says Morten Aalborg, CEO of Eidsiva Nett. – I want to thank Eidsiva Nett for their forward-looking approach, which has set high demands for the functionality and performance of the AMS solution. When ready, it will be one of the most advanced Automatic Meter Reading and Steering systems in Europe, says Thor-Erik Næss, Managing Director of Aidon in Norway. 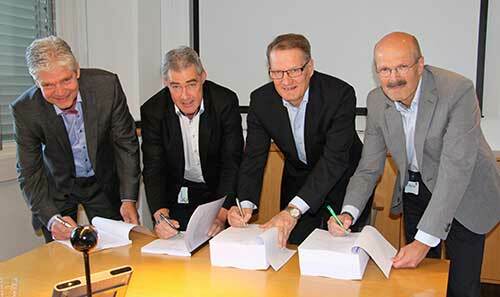 The value of the contract is 160 million NOK and the full roll-out of the new meters is planned to start in 2016. From the left: Thor-Erik Næss, Managing director, Aidon in Norway, Leif Henning Asla, Head of Board, Eidsiva Nett, Timo Chrons, CEO, Aidon, and Morten Aalborg, CEO, Eidsiva Nett. Aidon is a leading provider of open-architecture based smart metering systems and new generation energy service devices in the Nordics. Aidon’s products serve today more than a million metering points in the Nordics. Aidon has offices in Jyväskylä and Vantaa in Finland, Täby in Sweden and Asker in Norway.